Evans was born in Wales, the son of a seaman. At the age of 15, he joined the Royal Navy. In 1899 he was serving on HMS Majestic, where Scott was serving as junior officer, a lieutenant. At the time Scott chose Evans, he was a Petty Officer (1st Class). He was undoubtedly a hard bitten sailor. "Evans, a giant worker with a really remarkable headpiece. It is only now I realise how much has been due to him. Our ski shoes and crampons have been absolutely indispensable, and if the original ideas were not his, the details of manufacture and design and the good workmanship are his alone. He is responsible for every sledge, every sledge fitting, tents, sleeping-bags, harness, and when one cannot recall a single expression of dissatisfaction with any one of these items, it shows what an invaluable assistant he has been. Now, besides superintending the putting up of the tent, he thinks out and arranges the packing of the sledge; it is extraordinary how neatly and handily everything is stowed, and how much study has been given to preserving the suppleness and good running qualities of the machine. On the Barrier, before the ponies were killed, he was ever roaming round, correcting faults of stowage." On the return journey, Edgar Evans was the first of the five to die. He had suffered a wound to his hand as the group approached the pole. When the group made the wound became infected; plus, he was suffering from frostbite to his fingers, nose and cheeks. 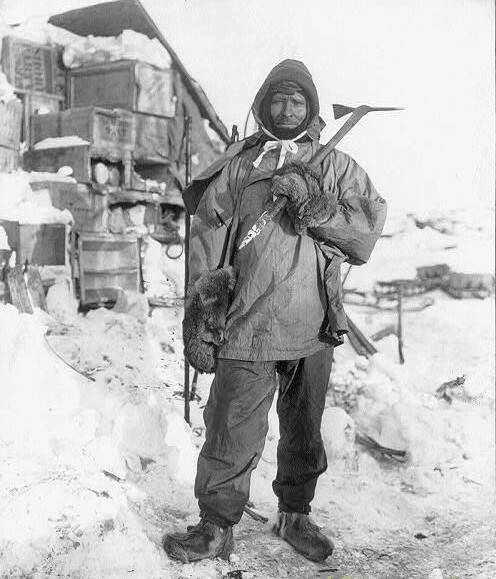 On descending the Beardmore Glacier, it is thought (for none of them lived to tell of it) that Evans fell into a crevasse and struck his head. On February 16th, nearing the base of the glacier, Evans collapsed and within days was dead; his body was buried in the snow near by and was not recovered.